I love sharing my passion for creativity through calligraphy, and teaching others not only how to use a calligraphy pen but how to practice and develop a style that is unique and memorable. I’ve taught over 2000 students, from the U.S. to Australia, for small private parties, office events, client events, as well as larger workshops for corporate groups like Facebook and Snapchat. Join me at an in person workshop to learn the art of modern calligraphy and how to create beautiful styled script lettering. In person workshops are highly recommended to gain solid understanding of the craft, but if you live too far and can't attend a workshop in person or you're looking to practice specifically from my class alphabet worksheets, check out the downloadable alphabet templates! Private workshops can be arranged and tailored to fit your group’s needs. If you’d like to host a workshop for your company or group or friends, or host a class at your shop, get in touch! Details please! Dates/times, questions, group size, info about the space, etc. Thank you! I'll be in touch in the next 2-3 business days. Regular classes are offered in the SoCal area, and occasionally elsewhere. To receive updates when new workshop dates are announced, pop in your email below. This was my first workshop class for anything and the experience was very lovely! It is easy to go online and find tutorials to learn new hobbies/activities but being in a class setting is completely different. There were many basic skills that I realized I haven’t achieved yet so this class was a great foundation to start on. The class is an intimate size and Angi is great at making sure everyone is getting personal attention and feedback. 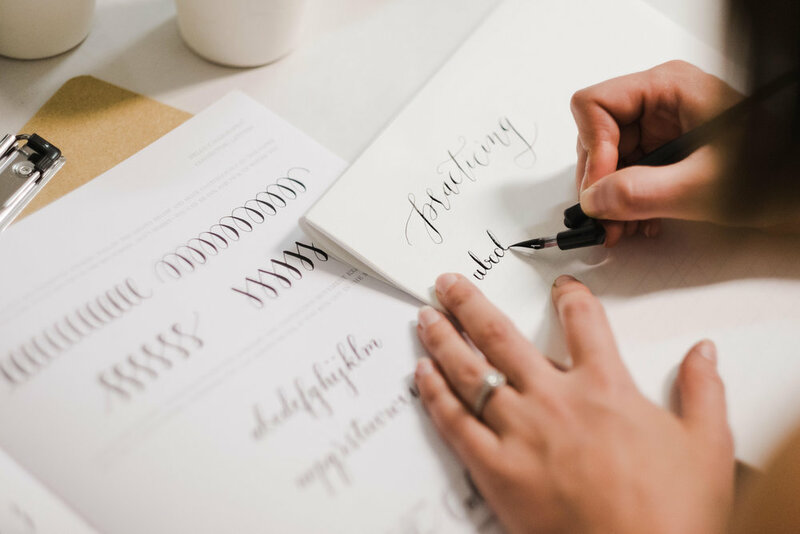 In the beginner class, you will learn how to properly hold an oblique calligraphy pen, gain an understanding of pen strokes and creating letterforms, controlling the pen, and connecting letters. In this course, you will also get an introduction to composition and styling, and personal one-on-one instruction and feedback from Angi, so you can walk away with all the tools you need for developing your skill and style. A thoughtfully curated and beautifully presented complete set of beginner supplies including my instructional guide book with practice alphabets and tips on styling is included for you to take home for practice! If you have taken my beginner class or a similar intro class with an oblique calligraphy pen, in the intermediate class you’ll dive further into style development, connecting letters, mixing custom colors, using gouache, flourishing and composition. A thoughtfully curated and beautifully presented complete set of supplies including an upgraded pen holder, new nib, gouache color tubes, mixing jar, pad of practice paper, intermediate practice worksheets, my intermediate practice guide book with two alphabet exemplars and styling exercises, examples, and tips and extra goodies & surprises!